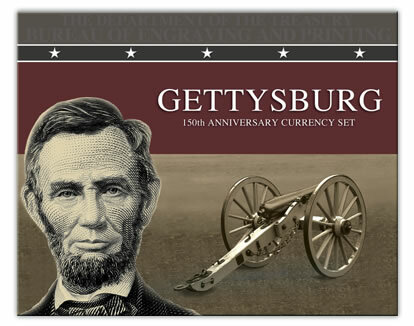 At 8 AM ET on Tuesday, August 13, 2013, the Bureau of Engraving and Printing (BEP) will begin selling its Gettysburg 150th Anniversary Currency Set for $39.95. Limited to 5,000 complete sets and likely to sellout, money collectors buying now will receive a $5 bill and $2 bill that have serial numbers with unique beginning digits and the same last four digits. Series 2009 $2 note from the Federal Reserve Bank of New York with a serial number that begins with "2013"
These notes are protected by a clear, acid-free polymer sleeve and are held in a commemorative tri-fold folder. Those who order the currency set before September 2, 2013 will also receive a small engraved portrait of Abraham Lincoln. There is a limit of two complimentary Lincoln portraits per household in the event multiple sets are ordered. Customers may place orders for the Gettysburg 150th Anniversary Currency Set directly at the Bureau of Engraving and Printing store found online at www.moneyfactorystore.gov or by calling 1-800-456-3408. From August 13 until September 2, the BEP is limiting household orders to 25 sets. When the pre-release period expires, the household limit will be lifted and bulk pricing of $34.95 will be available for quantities of 25 or more, providing a sellout has not occurred. In related news, the BEP and United States Mint have announced that Treasurer of the U.S. Rosie Rios will attend the American Numismatic Association’s World’s Fair of Money show on Thursday, August 15, 2013. Rios will conduct a forum at the World Mint Stage at 11:30 AM where attendees can ask questions and hear about issues pertaining to the Bureau of Engraving and Printing, the United States Mint and Department of the Treasury. Later, Rios will sign currency at the BEP/Mint booth, #143, from 1:00 PM – 3:00 PM. Additionally, on August 13, 2013, U.S. Mint Deputy Director Richard A. Peterson will sign autographs at the BEP/Mint booth from 11:15 AM – 11:45 AM. Peterson will also host a coin forum in meeting room #6 from 1:00 PM – 2:00 PM. To learn more about some of the BEP and U.S. Mint exhibits and product offered at the show, read this news release. Absolutely a quick sellout this one should be, like all other 2013 products from BEP. $35 for $7 worth of currency. I have never understood the significance of having a the first 4 digits being a certain number. When they included the $5 bill in the Eagle and $5 set, I just deducted the $5 from the cost of the Eagle. I never thought of it as anything special. I just saw it as a $5 bill. Well, just imagine you stumbled on a one dollar bill in your pocket change that started with 1732 and ended with 1799. Do you think a George Washington collector would be interested in owning that? Just sayin’ that everyone has something that tickles their fancy, and we Americans love to commemorate our important historical anniversaries and collect its relevant memorabilia.